Within a Cast Circle during the waning Moon carve on a black candle a representation or words that embody that which you wish to no longer have in your life. On a white candle carve a representation or words that embody that which you wish to bring into your life. 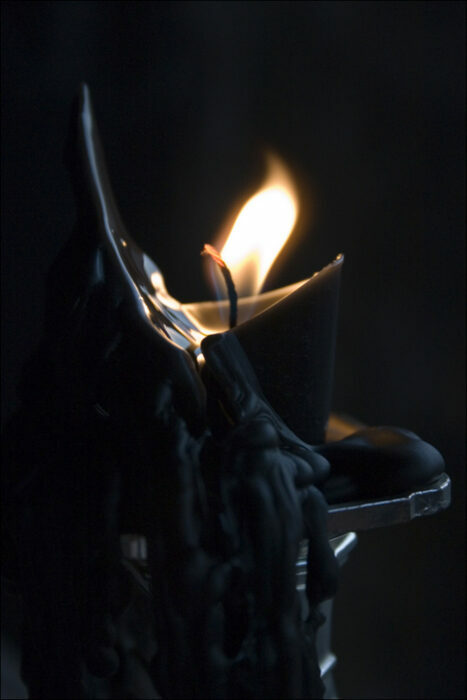 Anoint the black candle with banishing oil made with dragon's blood or lemon essential oil. Hold it in your hands and envision that which you wish to banish. Anoint the white candle with healing and protection oil with sweet orange, pine or rose geranium essential oil. Hold it in your hands and envision that which you wish to bring into your life. The world before me is restored in beauty. The world behind me is restored in beauty. The world below me is restored in beauty. The world above me is restored in beauty. All things around me are restored in beauty. My voice is restored in beauty. Take some time and meditate on the results that you expect, see the results already manifested in your life. Do not blow out your candles, allow them to burn out.